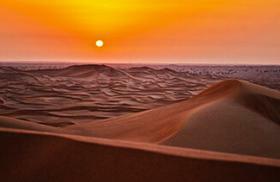 Experience a special 4 days tour to the desert of Zagora and Merzoga dunes departing from Marrakech. 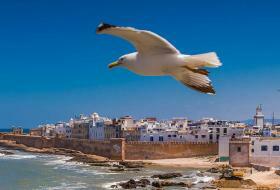 This trip will take you on an adventure through the beautiful landscapes of southern Morocco by discovering the history of Ait Benhaddou kasbah, visiting the film studios of Ouarzazate and crossing Deraa & Todra rivers. 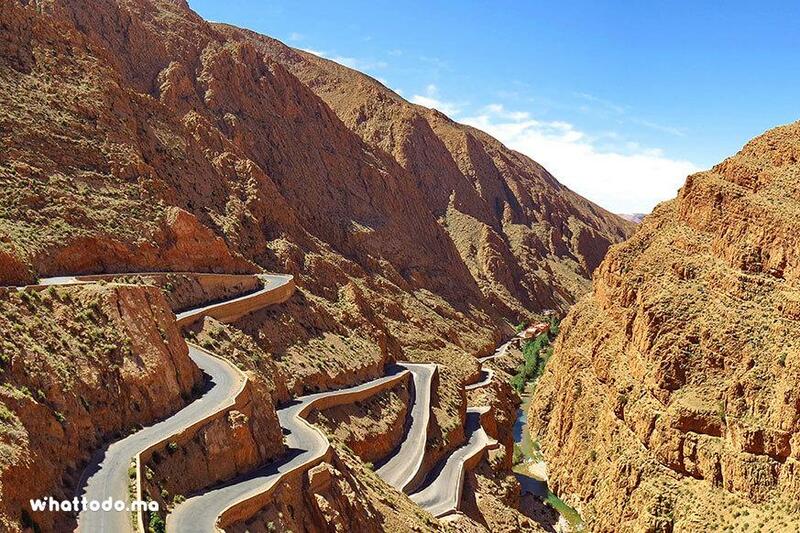 You will be picked up from your accommodation in Marrakech and head out over the High Atlas Mountains (considered as a footbridge towards the Sahara desert) and driver over the stunning Tizi n'Tichka pass (2260 m of altitude) as well as many Berber villages. 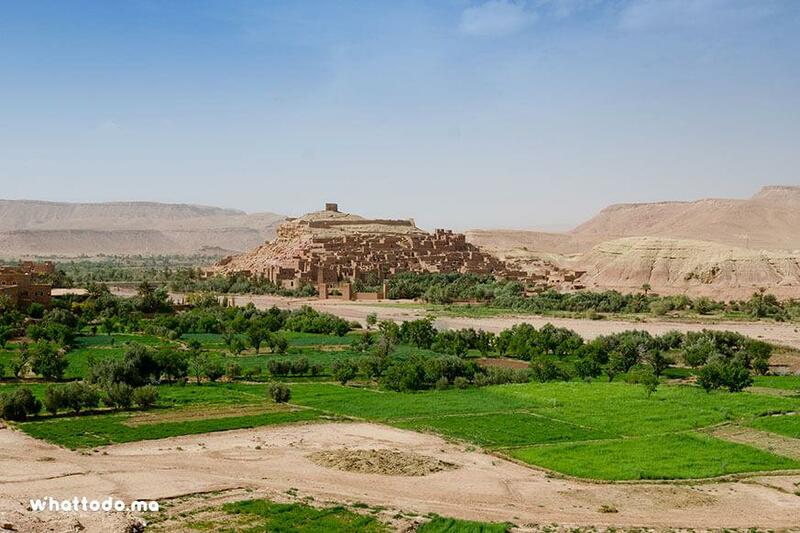 You’ll firstly stop to visit Ait Benhaddou Kasbah; a UNESCO World Heritage site that has had several famous films shooting. 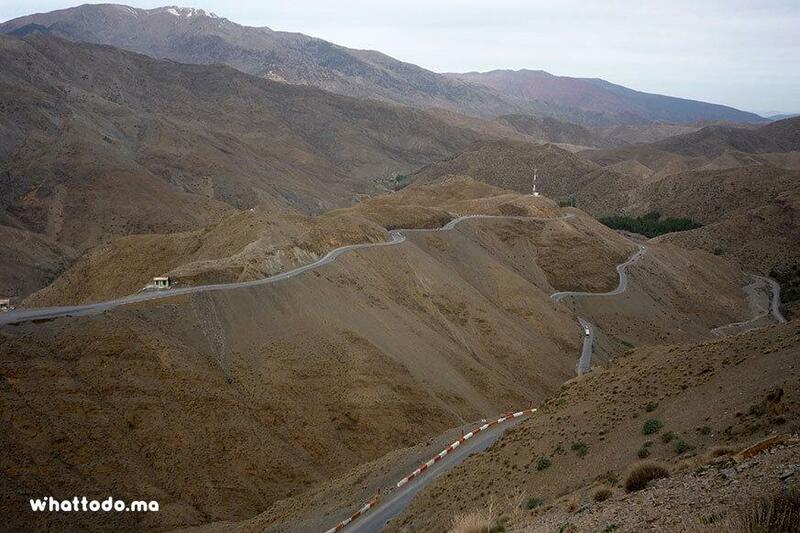 After lunch, you will continue your tour to Boumalne Dades passing by the road of the thousand Kasbahs, Roses valley and the Kelaa of Megouna to reach your accommodation in Dades Gorges. 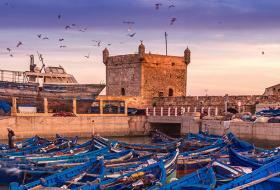 You will spend your first night in a hotel after tasting some Berber dishes during dinner. After breakfast at your hotel, take the picturesque mountain road that pass through Todra Gorges (splendid and natural site with high cliffs of 300 m) and explore the canyons around a cold river that flows down the gorge into the palm grove of Todra Valley. Enjoy lunch in a local restaurant before heading for the impressive dunes of Erg Chebbi in Merzouga. Late in the afternoon, you’ll pick up your camel and go for trek to enjoy the beautiful sunset on the dunes barefoot in the sand. A magical place where the dunes glow with golden shades before igniting in red, orange, pale pink, a whole palette of shapes and colors drawn by the last lights of the day. 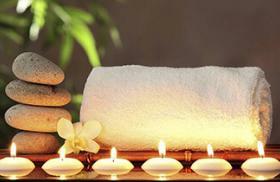 Your second night will be in a nomad tent at a desert camp. 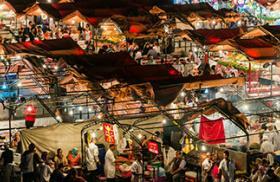 But before, enjoy a Saharan dinner under the stars and around the caravanning fire. Dance to the rhythm of the music of the local nomads who will provide you with entertainment and show you how to play tam tam and Berber tambourines. 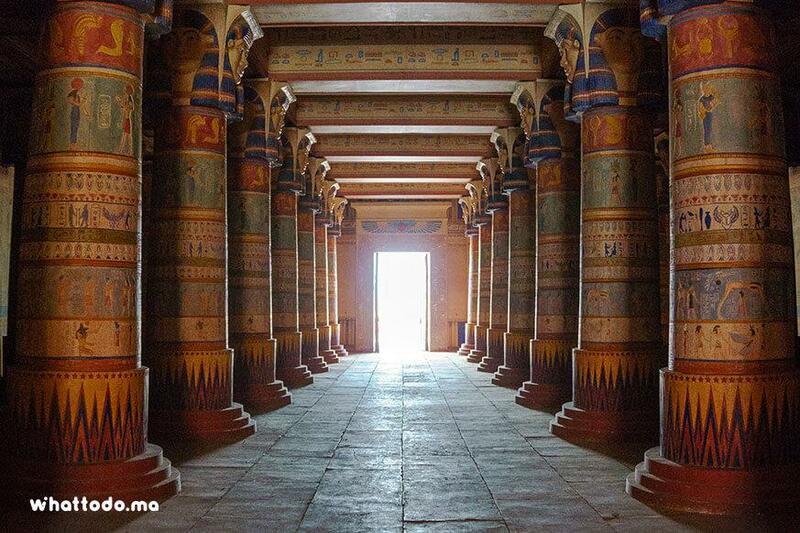 Early in the morning, you’ll see the first magical lights of the sun and the sunrise while riding your camel and climbing the dune. 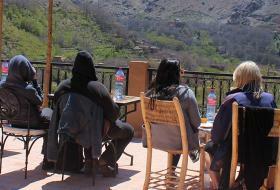 After breakfast, you will continue towards Zagora passing by oasis of Deraa valley and the pass of Tizi n'Tifinit. 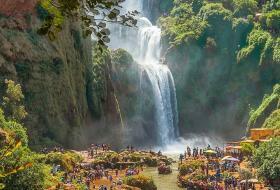 Located between the last mountains of Anti-Atlas and the first deserts of stone and sand, the Deraa Valley is one of the very large rivers of Morocco and one of the few in the south that has water abundant supply. After lunch, you will continue your road passing through Aït Sahoun and Tizi N Tifinit (region of Babel movie scenes shots). 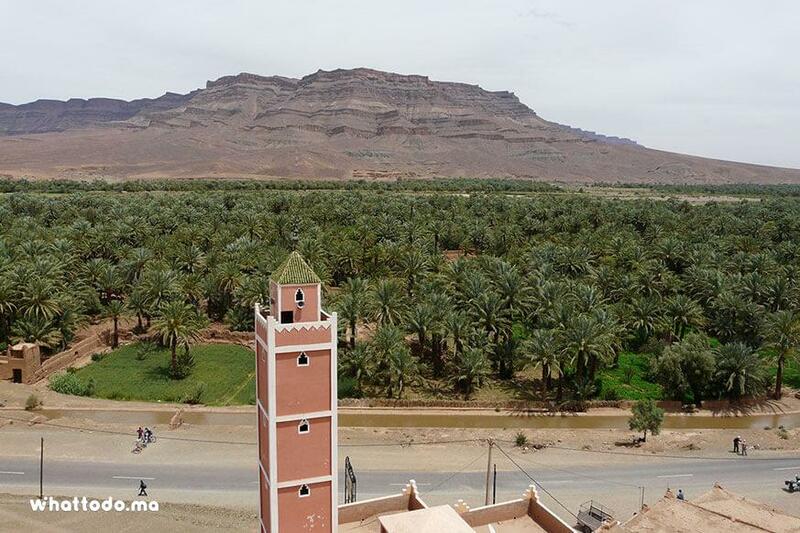 Then, enjoy a nice descent towards Zagora and watch the change of landscape that becomes softer and greener while approaching the huge palm grove of southern Morocco. 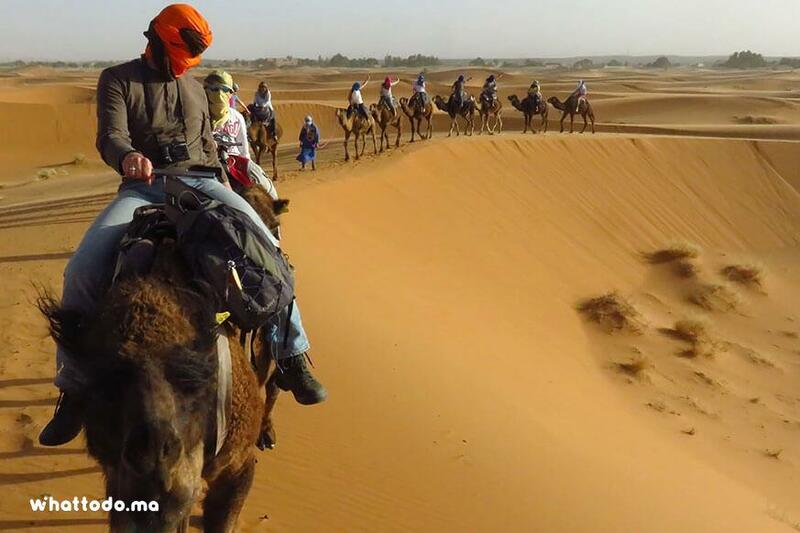 Enjoy the dunes of Zagora desert that were caravans passing place for Timbuktu and go for a camel ride to watch the sunset. Take dinner in the dunes and spend the night in a bivouac at the gates of the desert. Wake up very early to enjoy the sunrise in the dunes. 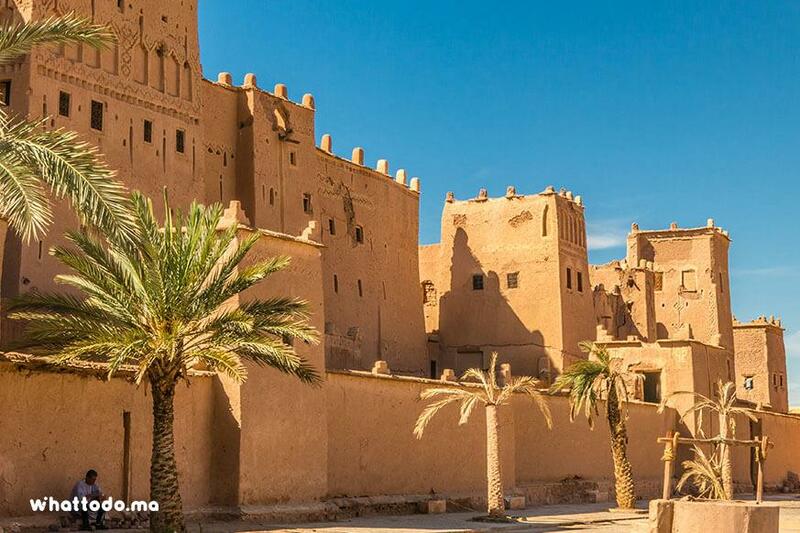 You will have breakfast in the desert before heading back to Ouarzazate for a visit to the cinema studios and the famous Kasbah of Taourirt which is the symbol of the city. This Kasbah is a national heritage; it was built around the middle of the eighteenth century and belonged to the Pacha Glaoui. 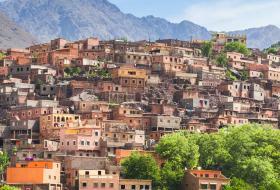 Take lunch on site before returning to Marrakech passing through the Atlas Mountains and the Tizi N Tichka. 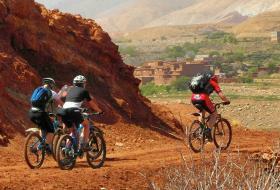 Cross the High Atlas via Tizi N'Tichka pass to reach the desert of Morocco. 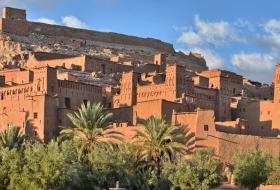 Discover the famous Kasbah of Aït Ben Haddou world heritage of UNESCO and explore the road of a thousand Kasbahs. 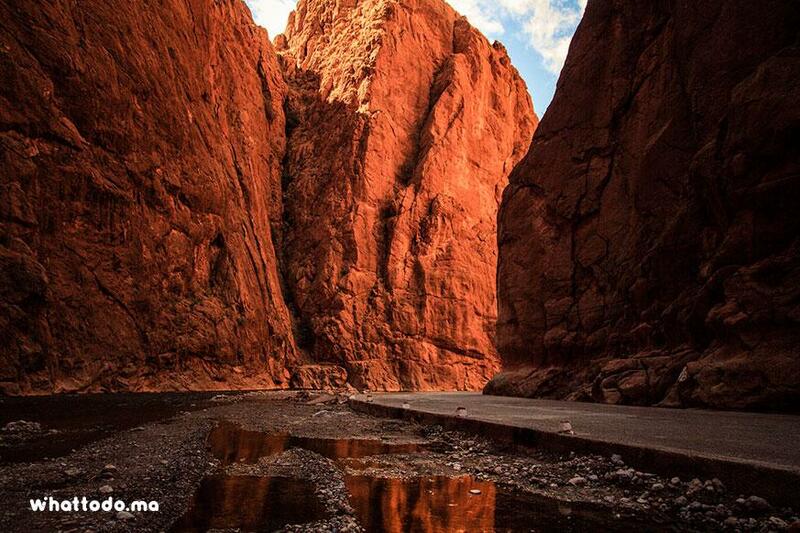 Go through the Roses valley, Kelaa Megouna and Dades Gorge to join Boumalen Dades. 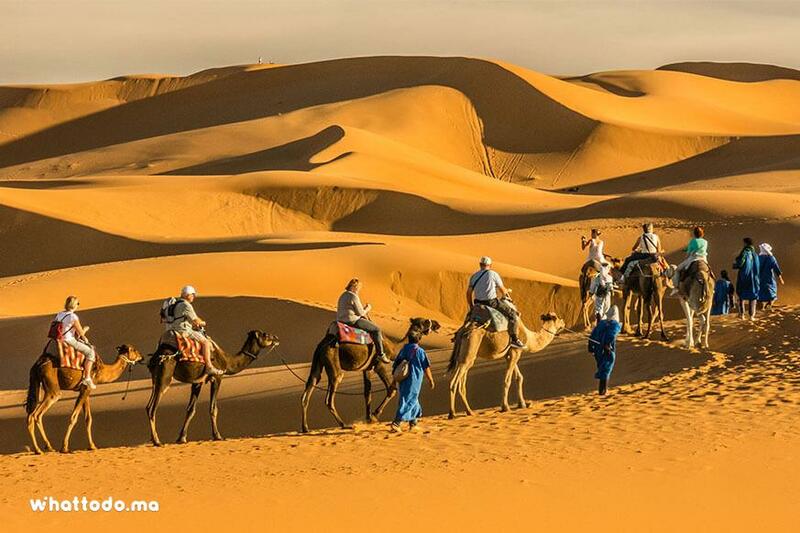 Cross the beautiful oases of Todra valley to regain Merzouga dunes. 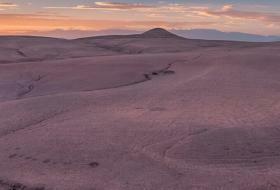 Take a camel ride through the fascinating Erg Chebbi Dunes and watch the sunrise and sunset. 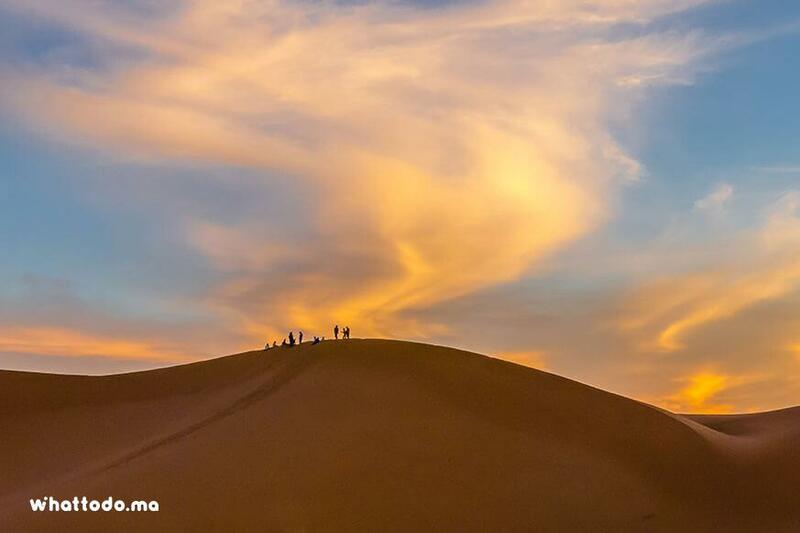 Enjoy an evening animated by the nomadic Berbers and spend the night in a tent in the middle of the sand dunes. 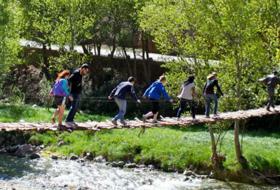 Enjoy stunning views on Deraa valley, Aït Sahoun and Tizi N Tifinit. Visit Zagora “the desert gate” old Saharan caravans passing place. 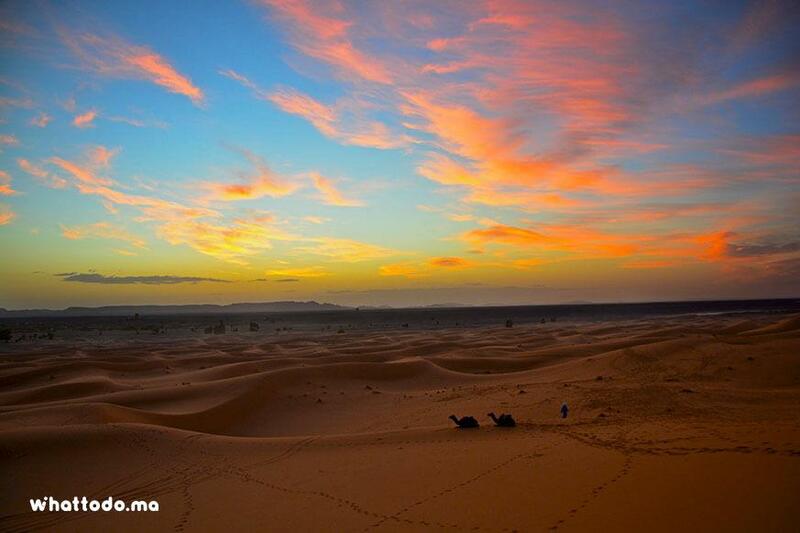 Sit on a camel back to watch the sunrise and sunset over the desert of Zagora. 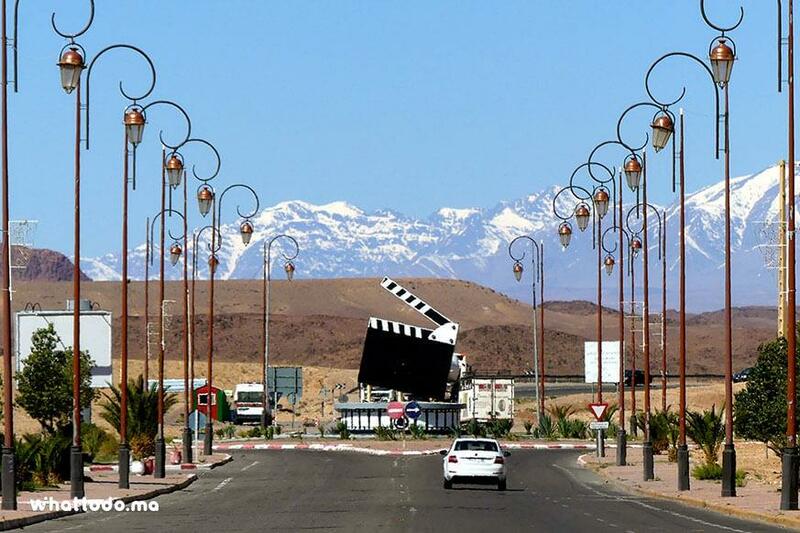 Admire the kasbah of Taourirt and visit the movie studios of Ouarzazate. 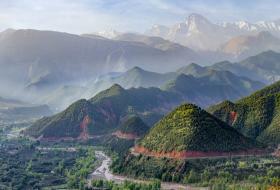 Enjoy stunning view on High Atlas Mountains while crossing Tizi N Tichki in the late evening. 1st in a hotel or a guest house, dinner and breakfast included.2nd and 3rd night in Bivouac (berber tent), practecly equipied even with electric solar energy. Dinner and breakfast included. Bring warm clothes in winter (no sleeping bags), light clothing in summer, sunscreen, hat, good walking shoes, and chargers for your cameras and mobile phones.